Five more weeks (six or seven? at the most!) We’re down to counting the weeks on one hand, and if we happen to go over by two weeks I don’t think it’ll be a problem. We know that the latest McLittle will be here is September 1 (even though his due date is August 25.) Edited to clarify: The teacher of our class this past weekend told us that we could go 42 weeks, but the practice I go to told us yesterday that they wouldn’t allow us to go past 41 weeks. So we know that McLittle will be here in approximately five (or six) weeks! How far along am I: 35 Weeks. Size of baby: McLittle weighs about 5 pounds. He is about 18 inches long. And he’s being compared to the size of a honeydew melon. Or a roasting chicken. I like honeydew melons more than chicken, though. Total Weight Gain/Loss: I’m (still) up 32 pounds. I managed to stay at the same weight this week. Not too bad, considering how I’ve overeaten in previous weeks. 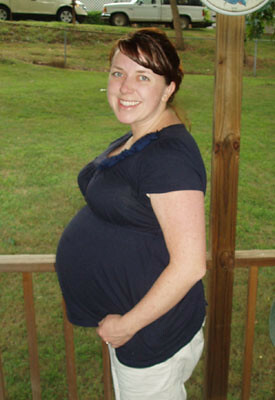 Clothes: Still plenty of maternity clothes. Hoping I don’t have to buy more to get me through the next five or so weeks. Gender: McLittle’s still a boy! Sleep: This has been a good week for sleeping, even if the concert meant I didn’t get as much that night. No waking up in the middle of the night. I’ve stopped eating and drinking anything that might be carbonated or have caffeine in it after 8:00. I have tried to drink only water after 7 or 8, just to be on the safe side. What I miss: Sleeping on my back – and having more space in bed. Cravings: I’ve eaten a lot of watermelon over the past couple of weeks! And it seems that my chicken aversion may be returning – at least certain types of chicken. I made it through dinner on Tuesday night, but Wednesday’s leftovers ended in the trash (after I tried to eat them. I will try not to go into too many gross details here.) So chicken may be ditched for a few more weeks. Symptoms: My hands are getting more swollen, as are my feet if I don’t allow myself enough time to rest. My hips are still sore when I’m laying down, and I’m a little more stiff when I wake up. And let’s not get into how exhausted I am in the afternoon, early evening. So. Tired. Best moment this week: We completed the birthing class, and we’ve worked our way up to weekly doctor appointments! We’re in the final weeks! I am so excited to watch you get closer and closer to meeting your little man!!! I am sorry to hear about the chicken, hope it doesn’t happen again. Love the shirt!